Ocrim Spa has two factories in Cremona, Italy. One is in the centre of town and is the historic home of this milling equipment manufacturer, and a new factory complex outside the town, on the banks of the local river, where it has four manufacturing spaces connected by a wide corridor and a separate area of dispatch, beside a three-story office block. This second site – referred to as its Port Factory - is expected to be enlarged further in the coming years and is reflecting the demands being placed on the milling industry’s suppliers that it produces more efficiently and quicker with greater return on investment. The ‘Port Factory’ is meeting that challenge. It runs a two-shift system, with the expectation to move to three shifts in the future, to maximise production. It has already adopted a new industry approach, where one highly-qualified staff member operates three machines and takes responsibility for their maintenance. “The market needs this approach,” says Alan Castellucci, Ocrim’s new Head of Production, who joined the company from an Italian agricultural machinery manufacturer, producing over 50,000 machines per year. “We are being obliged to provide these changes to reduce our operational costs. This is my experience. I see this approach happening in Europe, but it is not yet the case in the USA,” He says logistics in his previous industry cannot yet be replicated in the manufacture of milling machinery, but some aspects can be adopted. He also says the milling machinery industry should be looking towards using 3D printers, to provide specific components from metal, for example. “This is happening in the automotive industries, where car parts are ‘printed’ as they are needed on the assembly line. Printed, not only in plastics, but also, now, in metals. “In five years, this technology will be widespread, but it may take longer to reach our industry. Certainly, it will be here within 20 years. Future production will be this way,” he adds. 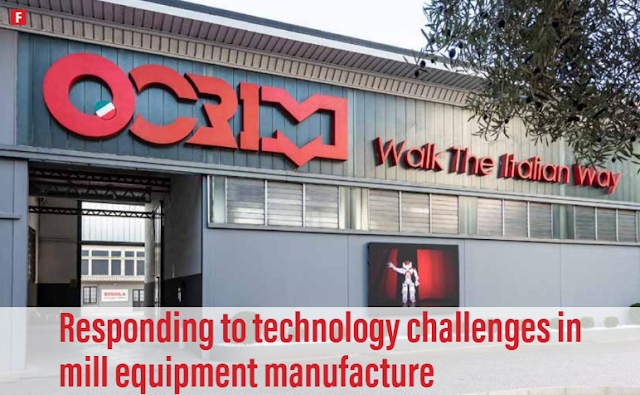 The ‘Internet of Things’ was developed for consumer use, but we now need an ‘Industrial Internet of Things’ to optimise sectors of a factory to meet the needs of companies such as Ocrim,” he adds. Ocrim employs some 300 people in its two Cremona factories. 154 are in production with 80 of those working at the Port Factory. It’s likely that this number will double over the next five years with plans to double the size of its Port complex. Visit the Ocrim website, HERE.